Crystal Dynamics is trying out some new ideas in Lara's latest adventure like co-op play and arcade-style leaderboards. 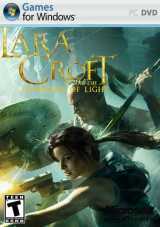 Lara teams up with Totec, the Guardian of Light, in order find an enchanted mirror – that means you'll be teaming up with a friend in order to solve the game's many puzzles. This is an arcade-inspired action romp with a fixed isometric camera and a focus on high scores and replay value. This latest Lara Croft adventure maintains much of the feeling of earlier games (tombs, booby-trap puzzles, and so on). The odd couple of Lara and Totec find themselves in a battle against Xoxolt, an evil spirit released from the Mirror who has the distinct advantage of controlling all manner of spirits to do his bidding. Expect to be going up against undead tribesmen, giant salamanders, and everything in between. Each playable character has unique weapons and skills for maneuvering through those Central American jungle ruins. Lara's got her iconic dual handguns (which, befitting of the retro style, have infinite ammo), and Totec hurls deadly spears. But these weapons aren't used purely for combat. For example, the spear works both against enemies and as a tool for traversing past obstacles: Totec can throw a spear into a wall to allow Lara to get up to an otherwise unreachable ledge. Lara, on the other hand, has a grapple hook to make it across seemingly impossible gaps, and Totec often must place his life in her hands with assisted jumps. Other co-op tricks include Lara's ability to jump on top of Totec's shield when he holds it above his head and Totec's tightrope walk across a gap using Lara's grapple rope. You'll also encounter a number of tombs to explore. These indoor caverns offer up the chance to take a break from the frenetic combat to do some old-fashioned puzzle solving. Think booby traps that can only be overcome with two people working as a team, and you've got a good idea for how these puzzles will function. This co-op system (added in a later patch) works both online and locally, featuring a drop-in system for adding a second player on the fly. The whole game can be played using a single player, as well.